Most of the images showing the transient changes in global mean temperatures (GMT) over the 20th Century and projections out to the 21st C, show temperature anomalies. An anomaly is the change in temperature relative to a baseline which usually the pre-industrial period, or a more recent climatology (1951-1980, or 1980-1999 etc.). With very few exceptions the changes are almost never shown in terms of absolute temperatures. So why is that? Clarity on Antarctic sea ice. I’ve always been a skeptic when it comes to Antarctic sea ice. I’m not referring here to the tiresome (and incorrect) claim that the expansion of sea ice around Antarctica somehow cancels out the dramatic losses of sea ice in the Arctic (NB: polar bears don’t really care if there is sea ice in Antarctica or not). Rather, I’m referring to the idea that the observation of Antarctic sea ice expansion represents a major conundrum in our understanding of the climate system, something one hears even from knowledgeable commentators. In this post, I’ll try to provide some clarity on this subject, with some basic background and discussion of a couple of important recent papers. …the largest Earth Science conference on the planet, and is where you will get previews of new science results, get a sense of what other experts think about current topics, and indulge in the more social side of being a scientist. 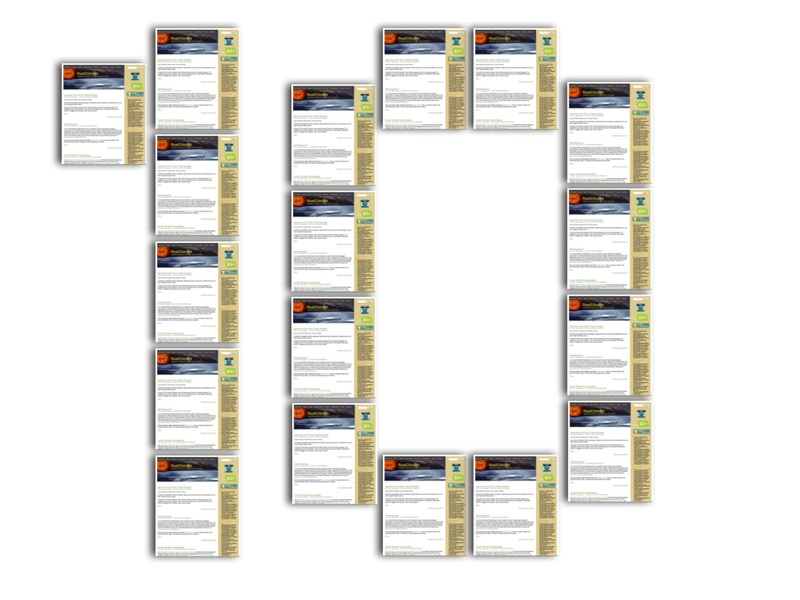 Ten Years of RealClimate: Where now? The landscape for science blogging, the public discourse on climate and our own roles in the scientific community have all changed radically over the last 10 years. Blogging is no longer something that stands apart from professional communications, the mainstream media or new online start-ups. The diversity of voices online has also increased widely: scientists blogging and interacting directly with the public via Twitter and Facebook are much more prevalent than in 2004. The conversations have also changed, and (for the most part) have become more nuanced. And a bunch of early career researchers with enthusiasm, time to spare and things to say, have morphed into institute directors and administrators with lots of new pressures. Obviously, blogging frequency has decreased in the last year or so in response to these pressures and this raises the question: where does RealClimate go now? In the spring of 2004, when we (individually) first started talking to people about starting a blog on climate science, almost everyone thought it was a great idea, but very few thought it was something they should get involved in. Today, scientists communicating on social media is far more commonplace. On the occasion of our 10 year anniversary today it is worth reflecting on the impact of those changes, what we’ve learned and where we go next. A sincere thanks to all. 2005 Water vapour: feedback or forcing? All numbers are estimates from latest available data, but no warranty is implied or provided so all use of these numbers is at your own risk. The “World Climate Widget” from Tony Watts’ blog is probably the most popular deceptive image among climate “skeptics”. We’ll take it under the microscope and show what it would look like when done properly. So called “climate skeptics” deploy an arsenal of misleading graphics, with which the human influence on the climate can be down played (here are two other examples deconstructed at Realclimate). The image below is especially widespread. It is displayed on many “climate skeptic” websites and is regularly updated. 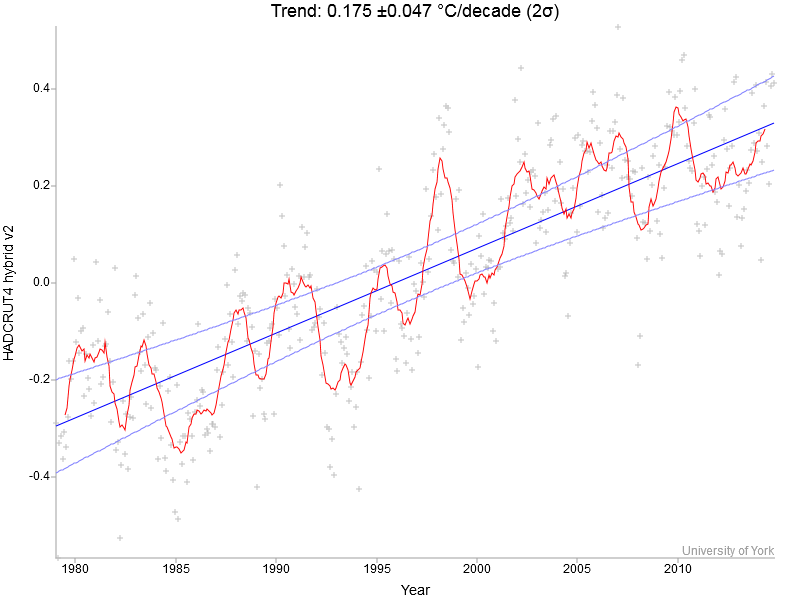 Recent global warming trends: significant or paused or what? As the World Meteorological Organisation WMO has just announced that “The year 2014 is on track to be the warmest, or one of the warmest years on record”, it is timely to have a look at recent global temperature changes. I’m going to use Kevin Cowtan’s nice interactive temperature plotting and trend calculation tool to provide some illustrations. I will be using the HadCRUT4 hybrid data, which have the most sophisticated method to fill data gaps in the Arctic with the help of satellites, but the same basic points can be illustrated with other data just as well. Let’s start by looking at the full record, which starts in 1979 since the satellites come online there (and it’s not long after global warming really took off). This month’s open thread. Think history, Lima, and upcoming additions of a single data point to timeseries based on arbitrary calendrical boundaries.